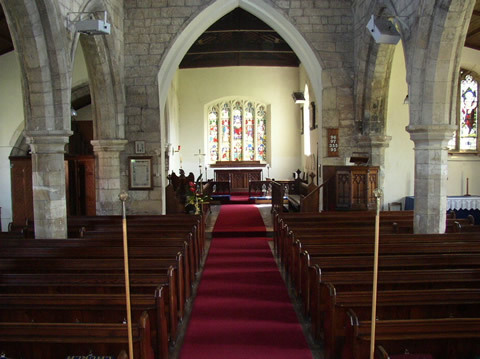 The nave has north and south aisles and ten rows of pews giving accommodation for about two hundred people. 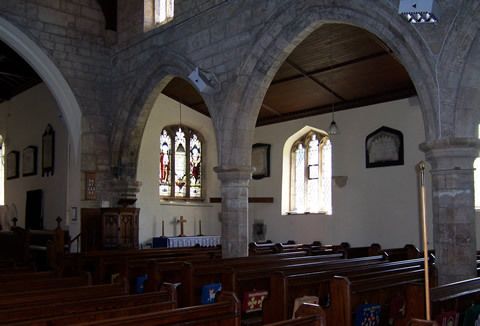 Both arcades have octagonal piers with moulded capitals exhibiting some nailhead ornamentation and double chamfered arches, all dating from 13th century. 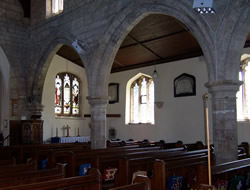 The windows in the aisles are perpendicular in style (15th century). 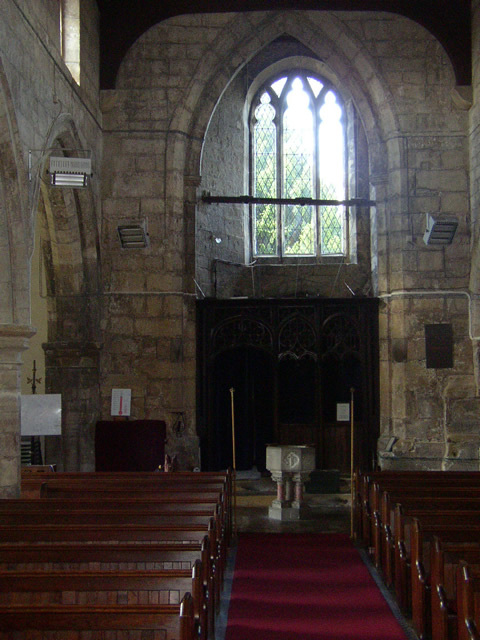 A higher tier of 15th century windows along the length of the nave constitutes the clerestory. 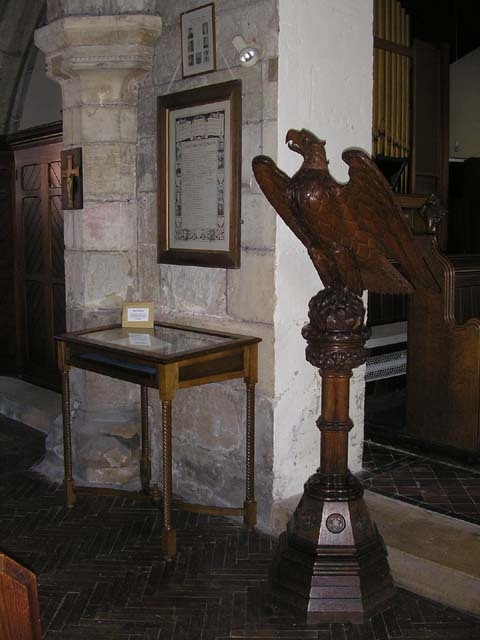 At the south east end stands the carved oak pulpit. 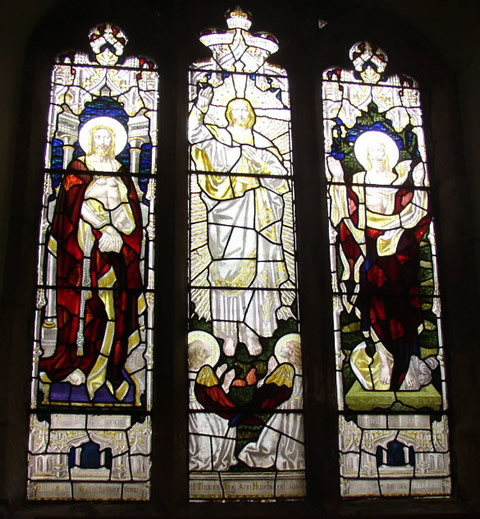 The south aisle ends in a stained glass window and below is a side altar. 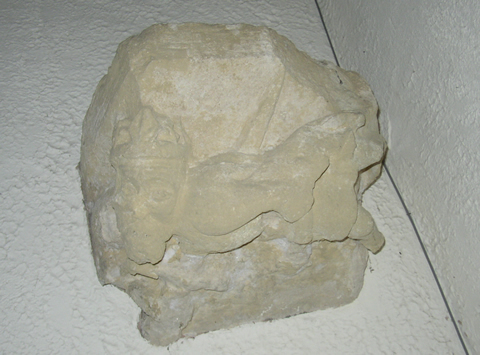 Above this, in the corner, is an image bracket of a little old man armed with a sword, his crowned head stuck on at right angles to his body. Nearby in the south wall is a piscine, thought to be over 700 years old, which at one time would have been used when washing the chalice. Part of the bowl would have projected forwards but this is missing. The crude construction of the piscine suggest an early date and its present position is unlikely to have been its original one, which suggests that is comes from the early sanctuary, being removed during part of the rebuilding. 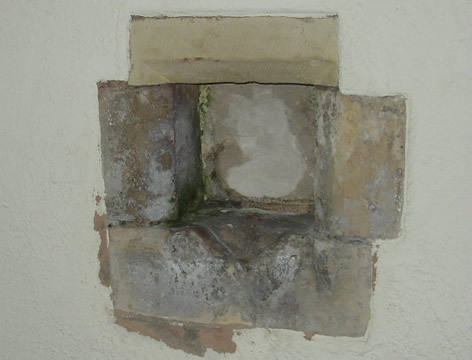 Also on the south wall, between the windows is another bracket with a carved head wearing a crown. On the west wall is another bracket but any carving can no longer be made out. 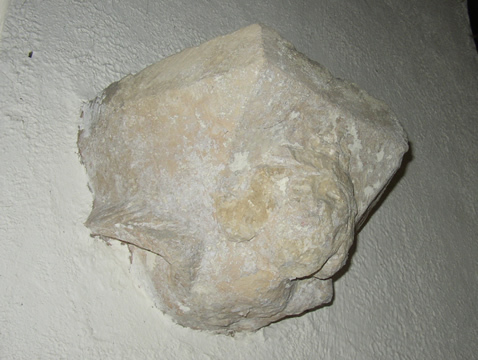 A corbel where the south arcade meets the west wall carries a carved face. 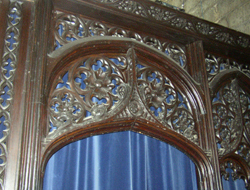 In the tower archway stands the middle portion of what was once the rood screen consisting of the doorway and two bays with fine tracery dating from c 1500. 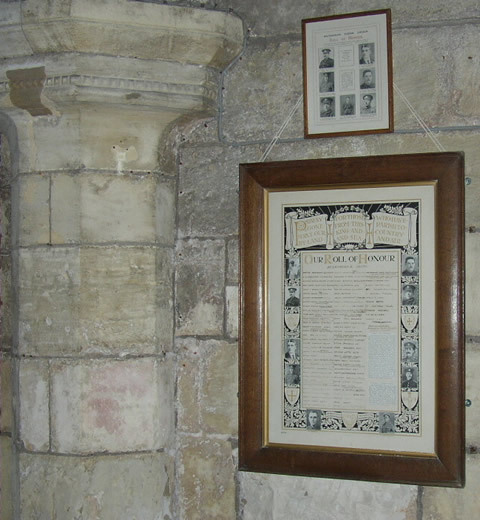 A brass plate on the west wall to the right of the tower arch is in memory of Mrs Marion Parkinson, one of the survivors of the troopship "Birkenhead", which sank off the Cape in 1852. As the three years and eight month old Marion Darkin she was travelling with her mother to join her father, Drum Major John Robert Darkin who was serving in the Queen's Regiment in South Africa. The Birkenhead had been specially modified for trooping which meant it was deprived of a number of watertight bulkheads. In December 1851, the ship sailed for South Africa with soldiers of eight different regiments as reinforcements for the Kaffir War. On February 26th 1852 the ship struck an uncharted rock in clear weather. Water flooded into the ship all the faster due to the missing bulkheads. Only three of the eight lifeboats could be launched which were used for the women and children, all of whom were saved. The soldiers and sailors stood in line to go down with the ship as it sank three miles off shore. Few could swim, 445 men were drowned or taken by sharks. The disaster caught the attention of the nation as an example of extreme bravery and heroism. It also resulted in the introduction of regular lifeboat drill. 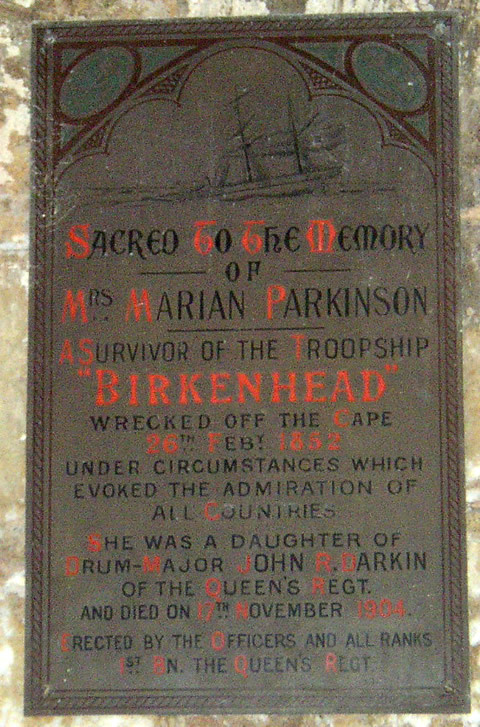 "Sacred to the memory of Mrs Marion Parkinson, a survivor of the troopship "BIRKENHEAD", wrecked off the Cape on 26 February 1852 under circumstances which evoked the admiration of all countries. She was the daughter of Drum-Major John R. Darkin of the Queen's Regiment and died on 17th November 1904. Erected by the Officers and all Ranks of the 1st Battalion The Queen's Regiment". Fifty years later an effort was made to trace all the survivors still living of whom there were then eighteen. Known endearingly as "A Daughter of the Regiment", Marion enjoyed a close relationship with her father's old regiment, who were represented at both her funeral and the unveiling ceremony of the memorial. 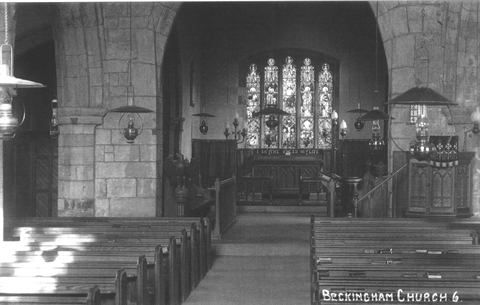 She was in service to the vicar of Beckingham, David Hooke, for several years before she married. 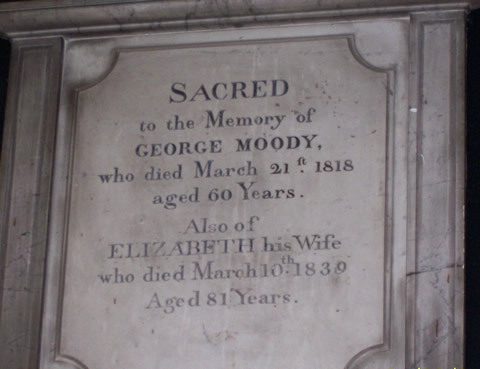 She lived in a cottage in Low Street and is believed to be buried in the old cemetery. 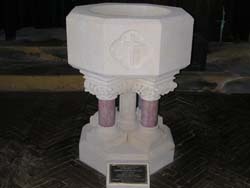 In the north-west corner of the nave is a lead lined Norman tub font,believed to be over 800 years old, no longer in use today having been superseded by the more modern one at the west end of the central aisle. 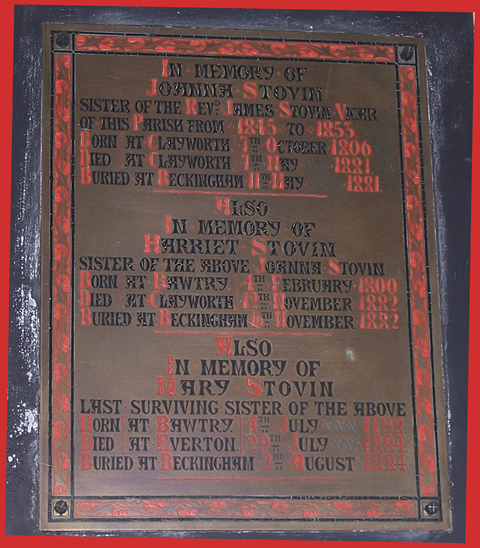 In 2009 the latter was removed to be cleaned and renovated, the work carried out in memory of Cannon Frank Levick by his family. In this corner also rests a slab said to carry an inscription in memory of one Roger Nasone, and dated 1530. The inscription is now difficult to decipher. 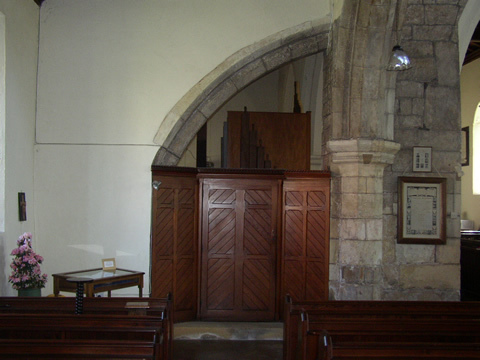 A doorway leads from the north wall into a new extension built onto the church in 2007/08. 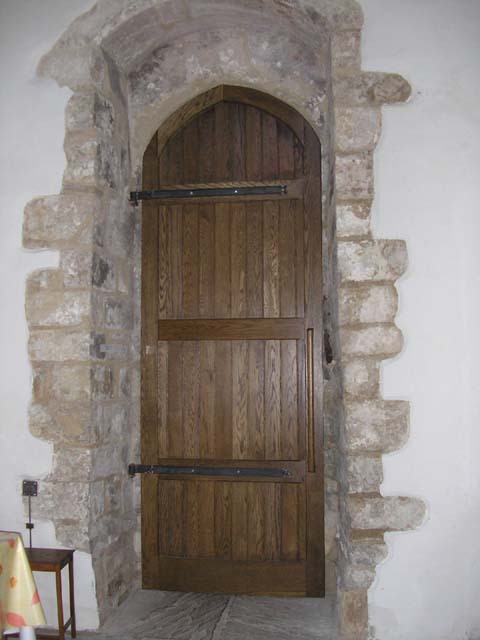 This impressive ornate doorway which had remained blocked for many years is believed to be Saxon or Norman. At the north east end of the nave is a fragment of 13th century archway which leads into the vestry. On this wall is the framed Roll of Honour dedicated to the men who gave their lives during the Great War. 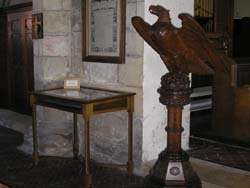 The carved oak lecturn also stands here. Beneath the Roll of Honour stands a beautiful cabinet specially designed and made by Russell and Jayne Hanson in memory of their parents. 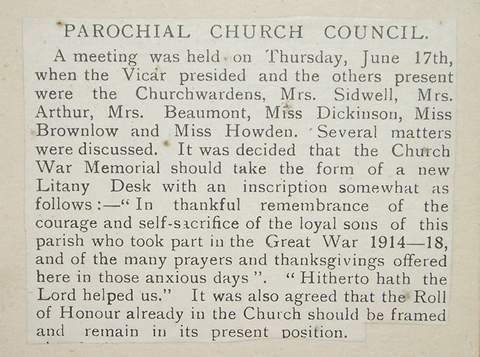 This houses the Remembrance Book donated to the Church. 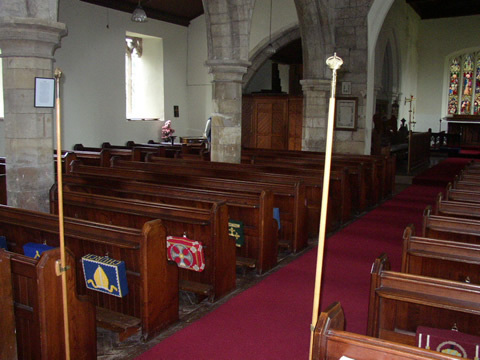 There are many kneelers (hassocks) within the church, of various designs, worked by different members of the community, donated to the church often in memory of a loved one. These were the result of a Kneeler Project started in 2003 and a beautiful book put together by the Project leaders is on display within a cabinet. The carpet in the nave and pulpit was relaid in 2002. Its purchase made possible, in part, by Eileen and Stephen Norris whose generous donation was made to mark their Golden Wedding. 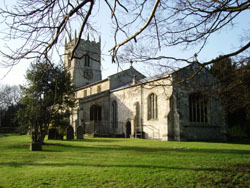 It was also made possible by the generosity of the many people who visited the church for the Flower Festival commemorating the Golden Jubilee of Queen Elizabeth II.